Eggs: Laid in rafts on the surface of the water. Hatch time varies on ambient temperatures, but is usually between 24-48 hours at room temperature. Larvae: Larvae go through 4 instars of development taking between 4-14days dependant on the ambient temperature. Pupae: Pupation takes 1-4 days after which the adult mosquito emerges on the surface of the water. Adult: During the summer the adult females will live for up to two weeks, during the winter months they will diapause becoming active again with a rise in temperature. Females take a blood meal to produce eggs which they then deposit onto the surface of the water 2-3 days after feeding. Culex are persistent biters, preferring to feed at dusk. 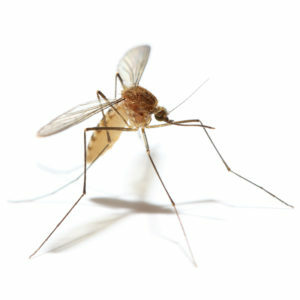 The adult mosquito will vary in size dependant on how much food the larvae consumed during its development, ranging from 3-7mm. The adult is a plain brown and appears to have a ‘furry’ thorax. Females will hold their bodies parallel to the surface which they are biting. Males can be distinguished from females by the feathering on the antenna. Widely distributed through Britain. Preferring to breed near sources of still freshwater, such as drains and underground sumps. Larvae will be visible in water at all instars. Adults are strong fliers, emitting a familiar drone whilst in flight. Bites are often inflamed and itchy on areas of the body exposed to the environment during sleep. 1. The British Pest Management Manual. Section 5, pg 171. 2. The American Mosquito Control Association.